I ran into a former lecturer of mine a few days back and I remembered how much I stressed myself during my last semester to please him. He was a Senior lecturer with a lot of clout and everyone, including me, wanted to be in his good books. I am very good at record keeping and typing and so I made it to being one of his favorite assistants. Then he became demanding. Ahhh. I was almost a secretary. I would type lecture notes, speeches, proposals and go on errands. At a point my academic work started suffering and then my spiritual life crashed. I was too tired to go for Bible studies or fellowship. I almost wept. I mean, I had displeased and stressed myself on top this guy’s matter for months and he didn’t even know my name. To him, I was just another ‘young lady’. That did it. I never resumed ‘work’ after that. I faced my studies squarely and worked on my spiritual life and graduated with excellent grades. Praise God. It is human nature to want to please other people. Some have a bad case of it though. We want to be accepted and loved by all. Sadly, we cannot please two masters. You can love people but you can’t go all out to please them all. Of course this does not mean that we go out of our way to displease people or be offensive to them. The point is to be true to God and the gospel even if it means upsetting people. 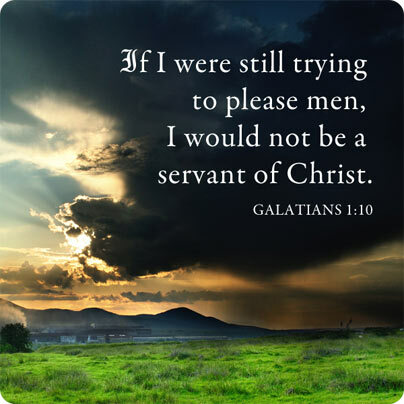 Galatians 1:10 says it all. I have come to realize that I cannot constantly worry about what others think of me and that an overwhelming need to please others is a form of slavery. I should be serving and loving God to the best of my ability. People may cast judgment on me, but their judgment doesn’t really matter. HIS DOES! 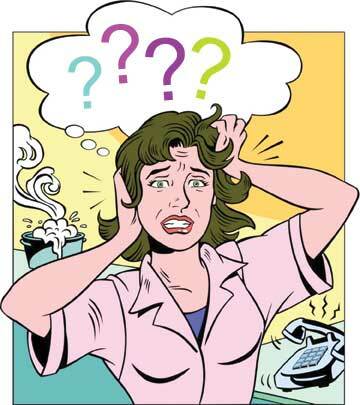 Ethel Barret once wrote- we should worry less about what others think of us if we realized how seldom they do. Pleasing people just frustrates you somehow. What pleased people last month will infuriate them today. Imagine how enslaving it is to try and please people-especially people who don’t often think of you. 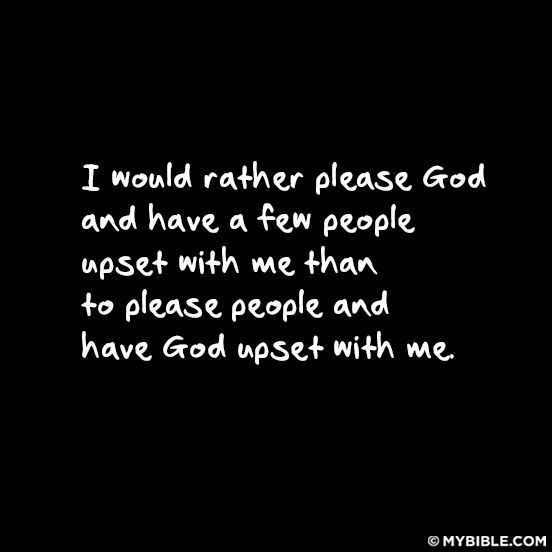 When we decide to please the Lord rather than people, God blesses us in the sight of people. Proverbs 16:7 tells us that when the Lord takes pleasure in anyone’s way, He causes their enemies to make peace with them. If we realized how often Jesus thinks of us, we would be absorbed with thinking of Him. 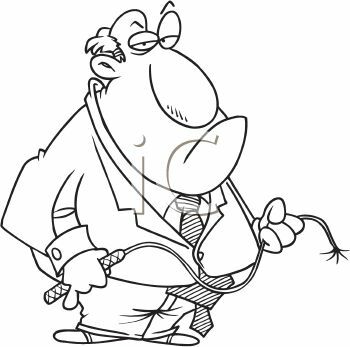 When pleasing man means displeasing God, it’s an unqualified evil and should have no place in the Christian’s heart. 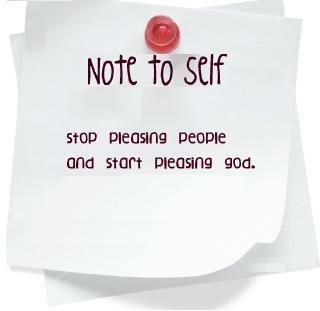 Posted on May 19, 2014, in Dear Jesus and tagged Choices, Godly living, Pleasing God. Bookmark the permalink. 60 Comments. We pray dat His great grace will be available to us in d hour of need to do the impossible dat will please our KING. How many of us are robbing God of His tenth(tithe),nd think it pleases Him?Our acts of disobedience whether partial or total displeases Him.If we cant trust Him enough to return our tithe,how can we trust Him on d day of reckoning to do great exploits nd remain true to Him to d end?Great faith is d product of our small small obedience to His Word. God bless you Ezzy for sharing this post… The comments are indeed priceless! May His grace cause us to decrease and please Him so the world will know He is our King!! No one engaged in warfare entangles himself with d affairs of this life,that he may please Him who enlisted him as a soldier(2 Tim2:4).I am a soldier for Christ with complete allegiance to my Master nd His Kingdom,nd not to any man.How about dat? I hail the men of old(men of faith) who in d time of great persecution refused to recant their faith in Christ in d face of terrible torture nd d accompanying death…some crucified,some eaten by hungry lions,stoned,scourged….etc.They refused to be released,but endured to d end ,so dat they might gain a better resurrection(Heb11:34-38).What great faith! Today our faith in God is weak nd compromised b/c our devotion to our God is not complete.For a worldly Church that loves d world,we dont expect much,nd can never please God.May God unite our divided heart to please Him in Jesus name,Amen!